It is a powerful wireless router with 6 * 5 dBi external antennas that provides fast speed up to 300Mbps, larger wireless coverage and stronger wireless signal for laptops, smartphones, tablets and other wireless-enabled devices. You can enjoy HD video streaming and online gaming with a fluid experience even in a big house, backyard anytime and anywhere. Breaks free from barriers and penetrate the wall easily with 6 * 5dBi antennas, provide reliable and stable connection, extend the WiFi coverage range. 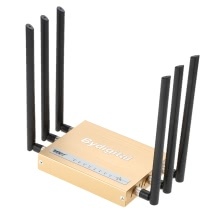 Built-in BROADCOM chip, support reliable, far-reaching 2.4G wireless network connection with speed up to 300Mbps, perfect for video streaming, web browsing, online gaming and file downloading. Multi-level wireless encryption options prevent unauthorized access and protect your important data. Anti-net stealing, fraud prevention, anti-crack, prevent malicious web sites. Manage Internet access as you like, set limits on when or how devices connect to Internet and you can supervise your children with parental controls. 3 adjustable transmitting power mode–100%(normal mode), 60%(balance mode), 30%(suitable for pregnant woman and sleeping), which can be set by your smartphone or computer. Only 3 steps for the first time set up the AP, easy to use without a CD. High performance, less than 50dB, quiet for you to sleep or work.